Carl Linnaeus (1707-1778) was an excellent naturalist. He is the father of modern taxonomy, and the popularizer of binomial nomenclature (the practice of giving species two part, Latin sounding names). At his death, his personal collection of specimens consisted of 14,000 plants, 3,198 insects and 1,564 shells. In 1735, Linnaeus stopped in Hamburg while en route to the Netherlands to earn his doctoral degree. There, he met with the mayor of the city who showed him the remains of a seven-headed hydra. The mayor was planning on selling the remains for an exorbitant amount of money. Unfortunately, Linnaeus quickly realized that it was nothing more than an amalgam of dead weasels and snakes glued together. He made his discovery public, and had to quickly leave Hamburg to escape the mayor's fury. 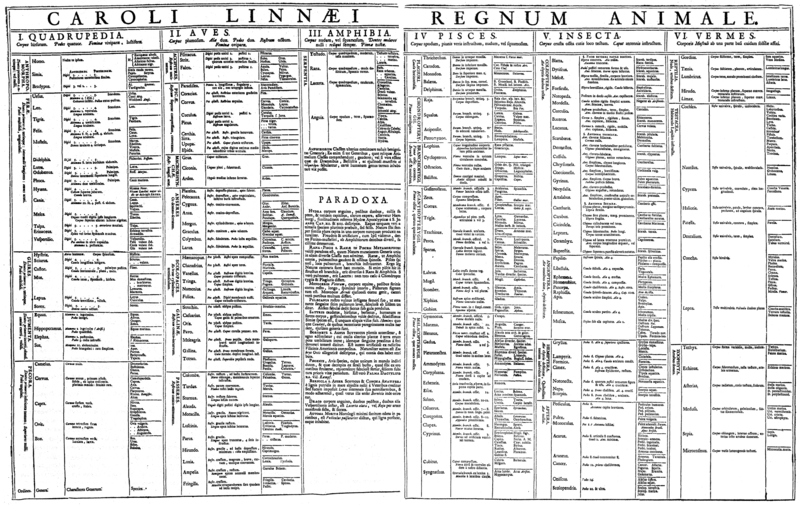 Linnaeus wrote and published ten editions of his revolutionary Systema Naturae, which organized and classified living species using binomial nomenclature, the first publication to do so consistently for both plants and animals. He also maintained his interest in trying to scientifically explain superstitions and cryptids. He asked the Swedish East India Company to find him a caveman (a request that was pursued in vain) and suggested that the remains of so-called dragons were actually from lizards. Linnaeus' own nomenclature is interesting as well. Up until his father, Linnaeus' ancestors had taken a version of their father's name as their surname. Thus, his father was called Nils Ingemarsson, or Nils, son of Ingemar. However, in naming his son, Nils latched onto an early 1700s fad- giving the family a permanent last name chosen from a word in Latin. He settled on "Linnaeus" after an enormous linden tree that grew on their property. Later, after the King of Sweden ennobled Linnaeus, he took the name Carl von Linné. The family coat of arms displays a twinflower. The twinflower was on of Linnaeus' favorite plants, and was given the binomial designation of Linnaea borealis in his honor. Finally, Linnaeus is the official type specimen for the species Homo sapiens, and specifically, its lectotype. Usually the type is the first individual of a species used to describe and identify the species. This kind of type is called a holotype, and according to the rules of the International Commission on Zoological Nomenclature, it must be kept in a museum, university, or other institution where public scientists can examine it. However, in Linnaeus' time, it was not yet the tradition to base the description of the species on a single individual, nor was it the tradition to preserve a particular individual for taxonomical efforts. So if a species was originally described using a series of specimens, any one of those specimens may be designated the official lectotype. We obviously know that Linnaeus was present when he himself was describing Homo sapiens, and so in 1959, W.T. Stearn suggested that we use Linnaeus as the type specimen. Linnaeus' remains continue to rest at Uppsala Cathedral, but this doesn't seem to distress the ICZN overly much. Q. Who is the Homo sapien type? K. Me. You. Most people. He also maintained his interest in trying to scientifically explain superstitions and cryptids. Just like to point out that while Linnaeus was the first scientist to use binomial nomenclature systematically, he did not invent it. The credit for that goes to the Swiss botanist Gaspard Bauhin (1560–1624).